Cooking without a Net: More Show . . . This is the front of a ribbed-yoke baby sweater from Debbie Bliss's Great Knits for Kids (a new revised version). I substituted Anny Blatt's Baby Blatt for the yarn used in the pattern. It's not this grey in person--I still have to figure out how to get closest to true with the camera. It's more of a slate/blue color, with a hint of grey in it. This is going to a woman at work, who's due mid-September. The pieces are all finished, so I'm pretty sure I can finish it up by then. When we moved our offices last year, my commute went from a 15 to a 45 minute bus ride, so I started bringing small projects along with me. 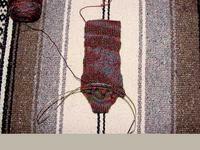 Right now I'm working on a lace sock pattern I got online from the Sock Bug. Ok kids. That's all for now.